Whirling Prom Animation 20181007 - SolarChat! Very nicely done, Christopher ! Yes! That’s amazing. I absolutely had a vision of whirling dervishes when I first saw the 45 frames in sequence and your rendition nails it. Thank so much! I used FireCapture, Autostakkert, IMPPG (sharpening), Photoshop (align and animate). I’m sure with time one develops patience but boy I’ll tell you, the first time around I just knew I had something and wanted to see it move I can see that I way undersharpened. And level adjust totally makes sense. From what you’re saying I gather I could load the 45 final frames in RegiStax and avoid having to manually align them in PS. Is that correct? Terrific. Many new things to try. I really appreciate all the feedback. Based on lots of great feedback here I've learned some new techniques and reprocessed this animation. I must say, the event takes on a bit of a different character. 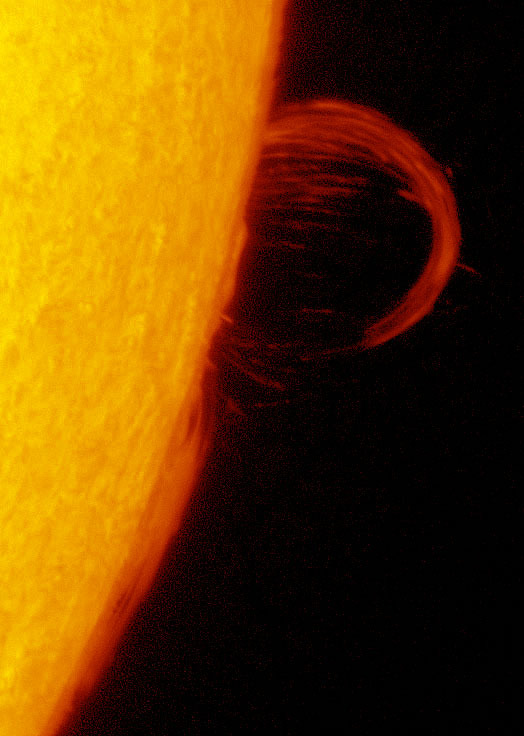 Rather than whirling proms, one sees quite clearly the massive double magnetic pulse unleashed through this prom group. Each of those pulses lasts just under 5 minutes in real time and they' occur about 20 minutes apart (the more powerful burst is first in sequence). Makes me wonder what I missed as I got clouded out at the end and still had some SSD space left This is all 44 frames (good and bad).